Scale setting is of central importance in lattice QCD. It is required to predict dimensional quantities in physical units. Moreover, it determines the relative lattice spacings of computations performed at different values of the bare coupling, and this is needed for extrapolating results into the continuum. Thus, we calculate a new quantity, w 0, for setting the scale in lattice QCD, which is based on the Wilson flow like the scale t 0 (M. Luscher, JHEP 08 (2010) 071). It is cheap and straightforward to implement and compute. In particular, it does not involve the delicate fitting of correlation functions at asymptotic times. It typically can be determined on the few per-mil level. We compute its continuum extrapolated value in 2 + 1-flavor QCD for physical and non-physical pion and kaon masses, to allow for mass-independent scale setting even away from the physical mass point. We demonstrate its robustness by computing it with two very different actions (one of them with staggered, the other with Wilson fermions) and by showing that the results agree for physical quark masses in the continuum limit. 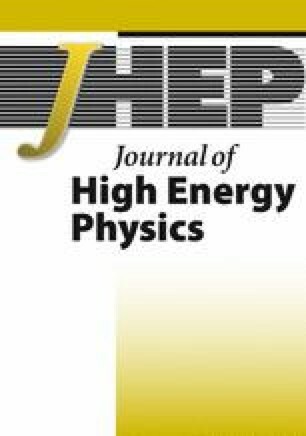 The online version of this article (doi: 10.1007/JHEP09(2012)010) contains supplementary material, which is available to authorized users. CPT is research unit UMR 7332 of the CNRS, of Aix-Marseille U. and of U. Sud Toulon-Var; it is affiliated with the CNRS’ research federation FRUMAM (FR 2291). A.S. Kronfeld, The f (D s) puzzle, arXiv:0912.0543 [INSPIRE].